These Xotics Matte Black & Gold hair cutting and thinning shears are made of J2 German steel and are coated with special powder, which not only improves durability and thus longevity, but also gives nice matte look. J2 German steel provides sharp and long-lasting cutting edges. Hair cutting shears have two razor edge hollow ground blades, but hair thinning scissors have one blade with 30 micro-teeth and one blade with razor edge which provides razor-sharp, precise and smooth hair cutting without any painful pulling or tearing. Both cutting and thinning shears are 5.5 inches long and 0.3 ounces lightweight which is very important for professional hairdressers who work daily and for several hours. As both of these Xotics scissors have customizable tension knob, every barber can customize them according to its needs and wants. Another feature of this Xotics product is removable finger rest which can be removed or attached at any time. Unfortunately, these scissors do not have finger inserts for finger holes, but at the same time they are still comfortable and easy to use. This Xotics set includes pair of hair cutting and hair thinning shears, as well as leather protective carrying case. As mentioned before, these Xotics hair scissors are coated with special powder which not only enhances their durability and longevity, but also gives them nice matte look. 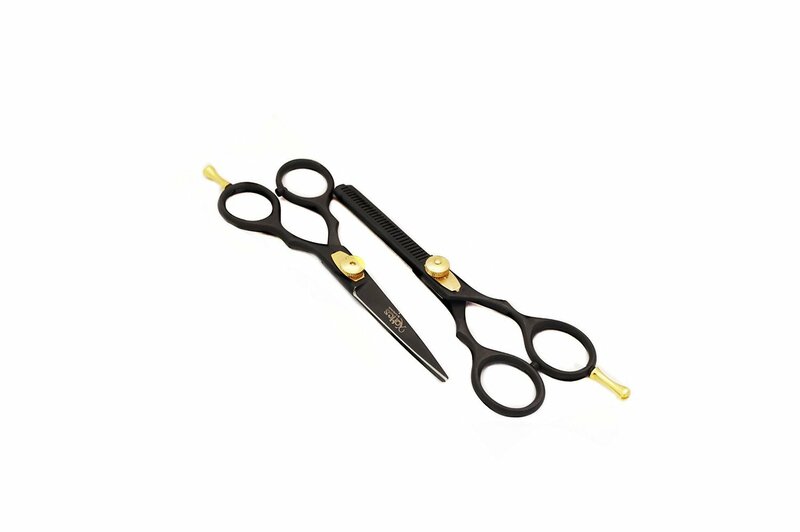 As a whole these shears are black, but they also have golden elements – finger rest and tension knob. Glossy golden elements are contrasting with matte black surface, giving modern and stylish look. As manufacturers say, this Xotics product can be used both by professional hairdressers in salons and hairdressing amateurs at home. As one might guess, cutting shears are intended for hair cutting, but thinning shears are meant for hair thinning or, in other words, for reducing of hair volume in certain hair sections. These Xotics Matte Black & Gold 5.5 Hair Shears are made of J2 German steel and are coated with special powder for superior durability and matte design. Both blades of hair cutting shears are razor edge hollow ground blades, but blades of hair thinning scissors differ from each other – as they are meant for hair thinning, one blade has razor edge, but other has 30 micro-teeth. Both cutting and thinning shears are 5.5 long and 0.3 ounces lightweight. Design of these scissors can be described as matte black and gold, because surface of scissors is matte black, but elements such as finger rest and tension knob are gold plated. As mentioned, both hair scissors have customizable tension knob and removable finger rest, but unfortunately they do not have rubber finger inserts for finger holes. These tools come in leather storage case which is included in set for free. These Xotics hair shears are suitable both for professionals and amateurs, therefore, you can cut or thin the hair wherever you want – in salon or at home.